You must have encountered “Obtaining IP Address…” error on your Android phone at least once in your lifetime. It’s an annoying problem that does not let the Android device connect to the Wi-Fi network successfully. The connection gets stuck at the same position showing “Obtaining IP Address…” error in Android phones and tablets. There are multiple issues related to Wi-Fi connectivity on Android and it’s one of them. Below methods will fix IP Address Unavailable, Obtaining IP Address, Failed to obtain IP Address and IP Address mismatch WiFi problem in Android. Basically when we try to connect with a wireless network then Wi-Fi scans the network and connects with your desired network by obtaining the IP address from the router. When the Android device fails to obtain IP address then it starts showing obtaining IP address error. The problem can be fixed by changing few settings on Android device or router. Obtaining IP address problem can be easily resolved by restarting your router/modem. You just need to restart your router to solve problems like “IP Address not Available”, “Failed to Obtain IP address”, “IP Address Unavailable” and “Obtaining IP Address”. The problem occurs because the Wi-Fi router is unable to assign an IP address to your Android phone or tablet. In this type of cases, restarting your phone or forget network option doesn’t help you out. It will give the same error again and again. Shut down the router and restart it after few seconds. Let the network bootup properly and then connect your Android device to Wi-Fi network and you will see that problem is resolved. The Android device gets the IP address via DHCP method. You can change the method to static IP. You will assign the IP in the Wi-Fi network settings according to the configuration of your network. Static IP will fix “Obtaining IP Address” problem along with few other Wi-Fi issues. 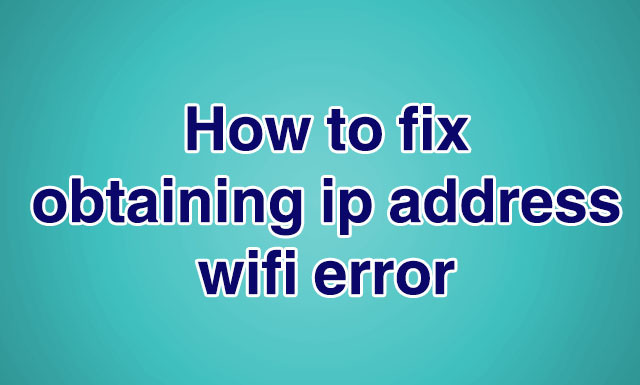 Static IP Address will fix IP Address Unavailable, Obtaining IP Address, Failed to obtain IP Address and IP Address mismatch WiFi problem in Android. Go to “Settings” option of Android phone or tablet. Press and hold your desired wireless network. You will see an option “Advanced Settings” or “Modify Network”. You can get the same by clicking on the network as well. Change IP setting to Static from DHCP. Now assign the IP address 192.168.1. *** (Number from 1 to 255). Make sure your assigned IP address doesn’t match any other device on the network. If it matches then it will lead to another error “IP Address Conflict”. Leave the rest of the settings as it is. Save changes. Your Wi-Fi will get connected and you can start browsing the Internet. You will get connected to Wi-Fi but there is a chance that you won’t get access to Internet. What you need to do is to change the setting back to DHCP while you are connected to Wi-Fi. The problem will be resolved. You should switch ON the Airplane mode for few seconds and then turn it off. Open the Wi-Fi settings from the notification menu or Settings. Connect to your desired network. It has helped many people solve this problem. We don’t know the reasons behind it but it may be due to some software issues. You can use some great apps that are available for free on Google play store. There is an app “WiFi Static”. You can manage static IP addresses through this app directly. You don’t have to go to settings and all that. Directly open the app and configure the settings. You can also try another app “Wi-Fi Fixer”. This app will analyze all the data related to Wi-Fi networks. It will also fix Wi-Fi network connectivity issues. You have to be patient while it fixes the network. It has helped a lot of people. The app has many positive reviews on Google play store. Performing a “Reset Network Settings” also fixes obtaining IP address problem for many devices. A reset network settings will reset all your WiFi network settings, Bluetooth settings, VPN settings and Cellular settings as well. You must save passwords of WiFi networks as you have to enter it again after performing the reset option. Hopefully the above methods will help you in fixing the obtaining IP Address problem along with other problems such as IP conflict error, IP Address unavailable and failed to obtain IP Address in Android phones and tablets. Above methods and settings can be performed on any Android device from Samsung, Xioami, MI, Moto, Micromax, OnePlus etc.. If you know any other method then please comment below so that we can list it in the above solutions. This entry was posted in Android Settings, Wi-Fi Connectivity Issues and tagged Fix Failed to Obtain IP Address in Android [Samsung], Fix IP Address Unavailable Samsung Phones, Fix Obtaining IP Address WiFi Problem in Android, How to Fix IP Address Mismatch in Android, Resolve IP Address Not Available in Android, Why Would Be My IP Address Unavailable [Android\ on January 5, 2018 by satyenhacks.